TeamSupport is considered as a complete customer support site which allows you to communicate and also work in collaboration at better efficiency, among your various departments, resources and also the clients providing more accurate and swift customer support response. This is among the best CRM software available in the market. 1. This software allows your business to operate as a single unit especially when it comes to customer issues. Your business’s support team can easily collaborate with other various departments like sales team, finance or technical team for making much better customer support. 2. With its own cloud-hosting plans and various scalable features, this software is aimed at B2B software industry for both small and large businesses. 3. Few of the most salient features of this software includes best-in-class reporting, proper screen recordings, efficient ticket management, advanced customer self-service areas. 4. Its internal chat feature provides the team with the ability to have real-time conversations with your business’s support time no matter where they are located. 5. Its mobile version is quite compatible and capable with various mobile platforms like iOS, BlackBerry, Android and Windows OS based phone. 1. It brings distinct visibility to all of your team members via collaborative tools which allow them to work together to rectify customer queries and concerns. 2. It allows to work in groups on the go regarding tickets while keeping the sales team along with the product developers in the same loop when it comes to critical issues related to the customer. 3. It allows keeping a tab on who is engaging with customers and the products involved which provides you the capability to manage your customer support on a proactive basis. 4. It gets the technical expertise of a help desk vendor which is focused on B2B software businesses. 5. It also sends quite a detailed instructions along with integrated video feature or also receives customer’s screen grabs regarding their problem. 6. It also provides a powerful search tool to your customers who suggest the knowledgebase content even when the customer puts in their query. 7. It also implements portal for Advanced Customer Service which provides your customers with round the clock support via the various platform such as knowledge base, community forum, etc. 1. Its drawback includes that it only provide annual subscription of support desk which costs at $40 per agent per month which can be a huge turn off for small businesses. For enterprise solution, it costs higher at $55 per agent per month which is also billed annually. ll in all, this software provides the basic and advanced functionalities which allow your business to address your customer’s queries and concerns. Its knowledge base and community forum allow the customer to self-rectify their problems which is an effective feature. Although this software comes only with annually billed plans, its features are completely worth it. 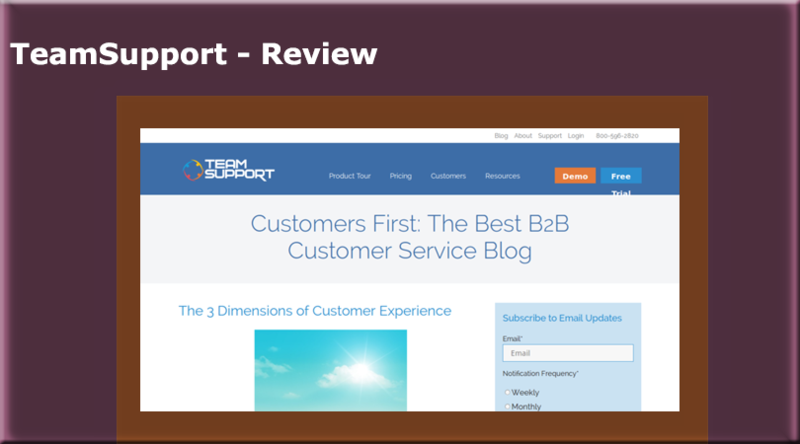 With this, we end our review of TeamSupport CRM software. In case you try this software, then do let us know about your views and experience regarding this software. You can also mention your suggestions in the comment section below.